Do you need to install insulation in the new home you’re building? Need to re-insulate your home? Tidewater Insulators can help—we’ve insulated both new and old homes. If you’re looking for spray foam insulation contractors in the Great Bridge, Virginia area, we are the company you need! Spray foam insulation is applied in liquid form, resembling wet paint, and is sprayed into the wall cavity (like its name suggests). It dries within seconds and expands into a thick foam that snugly fills the designated space and creates a tight seal. You can install spray foam insulation anywhere in your home—attic, basement, walls, around piping and ductwork, etc. Why Use Spray Foam Insulation in Your Great Bridge Home? Spray foam insulation is a good choice if you want to make your home in Great Bridge more energy-efficient and comfortable. We use BASF Sprayed Polyurethane Closed Cell Foam. BASF SPRAYTITE is a high-quality spray foam insulation that creates a continuous air barrier for the highest energy efficiency possible. 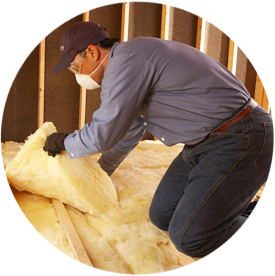 Wherever you need to insulate your Great Bridge home, spray foam insulation installed by Tidewater Insulators is a great solution. Air leaks can reduce the effectiveness of your insulation, and as we mentioned, spray foam insulation can help eliminate air leaks. Filling hard-to-reach places, voids, and cracks, it will keep your home warm in the winter and cool in the summer. You can even use spray foam insulation between floor joists, as well as around wiring, piping, and ductwork. This isn’t to say you shouldn’t have your home sealed! Sealing is just as important as insulation installation if you want a completely energy-efficient and comfortable house. Tidewater Insulators also offers air sealing as part of our comfort home program! No matter where you are in Great Bridge, talk to one of our experts today if you’re ready to install spray foam insulation in your home!